At the start of the year we had an enquiry come out of the blue via our website. Cambridge university were putting on their yearly spectacular event – The Downing May Ball. The question was simple: could you quote on delivering 1000 dishes spread across two options… and serve them all within four hours. This was rather an exciting proposition, one that we were really up for; a real challenge. The only slight worry – we’ve only run two events as a business so far, comprising of two hugely successful pop-up restaurant events, nowhere near 1000 dishes served inside 4 hours. We had a card up our sleeve though – Seb Holmes to the rescue! Seb, head chef of the fantastically reviewed Smoking Goat Restaurant on Denmark Street in London’s West End, and Grub’s resident genius, came up with a tasty Mealworm Singapore Noodles dish for them, with the second dish being possibly our most popular dish at the pop-up restaurants we held last year, Insect Miang: a flavour explosion with key components being buffalo worm and crickets. 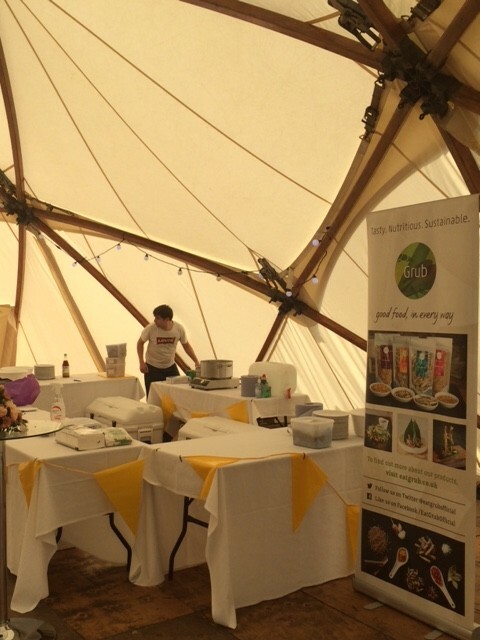 We prepared with two chefs the day before the event and then took our team up where we arrived to a Roald Dahl themed spectacle. Our location, yes you guessed it… inside a giant peach. 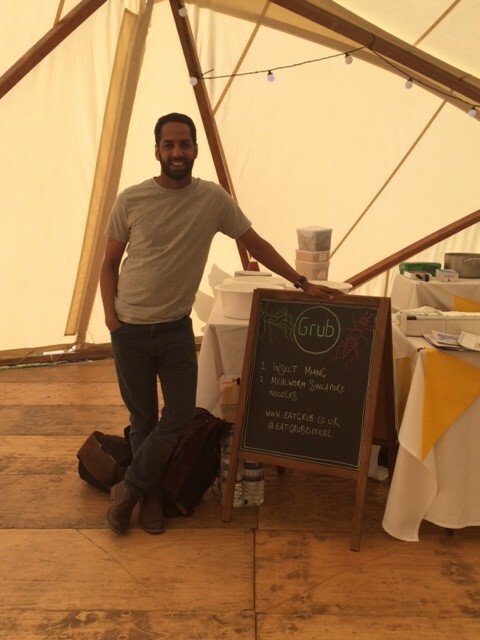 Here’s a couple of pics of the Grub set-up (taken by co-founder Neil) a couple of hours before the event started, and sadly the only pictures we took as it was so busy once we got going. The event was a resounding success, with an uptake rate that even surprised us. The students of Cambridge were certainly receptive to the idea of insects as a food, and why shouldn’t they be… Tasty, Nutritious and Sustainable! If you’d like to book us to run an event or cater for you, please get in touch via our contact form.